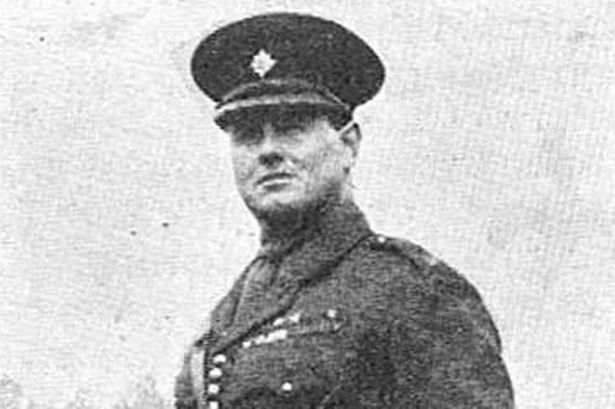 Lieutenant-Colonel James Neville Marshall became an inspiring and much-decorated hero of the First World War. Lieutenant-Colonel James Neville Marshall, a Foundation scholar of King Edward VI Camp Hill School for Boys from 1902-05, became an inspiring and much-decorated hero of the First World War. At Ors Communal Cemetery in France, he shares a last resting place with the war poet Wilfred Owen, who died in the same engagement and who described this Old Edwardian as “bold, robust, dashing, unscrupulous, cruel, jovial, immoral, vast-chested, handsome-headed, of free coarse speech”. Having already exercised his physical courage in civilian life, undertaking stunts such as high diving in fancy dress costumes to entertain the crowds, Marshall soon sought active service and became an inspiring military leader. Men under his command volunteered for the most dangerous missions. He suffered wounds on ten occasions and won several awards for outstanding bravery – the Military Cross and Bar, the French Croix de Guerre and the Belgian Chevalier of the Order of Leopold. In his last mission as commanding officer of the 16th Lancashire Fusiliers, to bridge the Sambre-Oise canal near Catillon in November 1918, he was shot down. For this gallant action he received the posthumous award of the Victoria Cross. The citation read: “The first party were soon killed or wounded, but the colonel’s personal example was such that more volunteers were instantly forthcoming.